During activity in the upper level of the Spaceport’s Final Assembly Building, ARSAT-1 is lowered into position atop its Ariane 5 launcher. 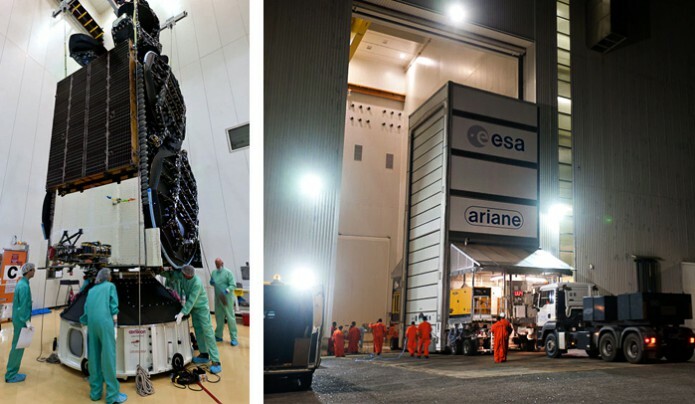 Final integration has begun for Arianespace’s heavy-lift mission on October 16, with ARSAT-1 now installed on the workhorse Ariane 5 launcher at the Spaceport in French Guiana. The spacecraft was positioned atop Ariane 5’s core cryogenic stage this week during activity inside the Spaceport’s launch vehicle Final Assembly Building – placing it as the lower passenger, to be released second in the flight sequence after its co-passenger, Intelsat 30, hosting the DLA-1 payload. ARSAT-1 is the milestone first geostationary satellite built in Argentina, produced by the company INVAP for operator ARSAT (Empresa Argentina de Soluciones Satelitales Sociedad Anonima) – with Airbus Defence and Space and Thales Alenia Space serving as leading equipment suppliers. 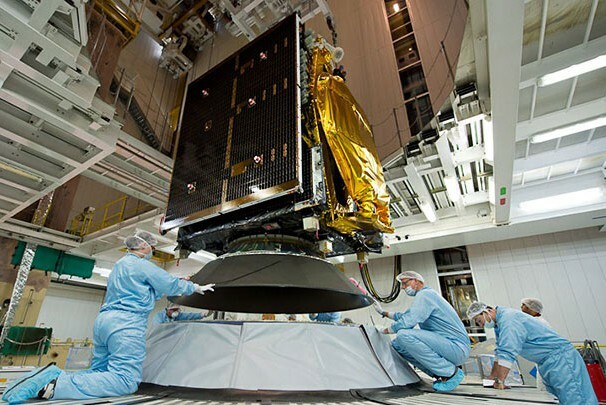 After its deployment by Ariane 5, ARSAT-1 will operate from an orbital position of 71.8 deg. West – from which it is to deliver a wide range of telecommunications, data transmission, telephone and television services across all of Argentina, Chile, Uruguay and Paraguay. Joining ARSAT-1 on this upcoming mission – designated Flight VA220 in Arianespace’s launcher family numbering system – is the Intelsat 30 co-passenger hosting the DLA-1 payload, which was built by SSL (Space Systems/Loral) for two long-time Arianespace customers: Intelsat and DIRECTV. Once in orbit, Intelsat 30/DLA-1 will greatly expand direct-to-home entertainment offerings in Latin America, as well as provide backup and restoration services.